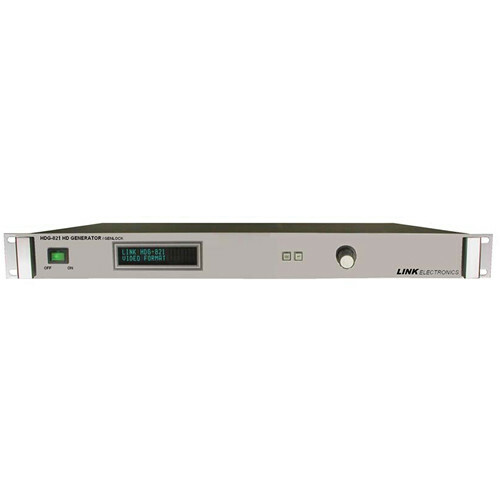 The HDG-821 Master Sync (Bi, Tri-Level) & HD Signal Generator from Link Electronics is a multi-format generator designed for use with HD signals. Tri-level sync is on all analog component outputs, RGB, or YUV. Sync output can be selected as Bi-level (black burst) or Tri-level. This unit occupies 1U of rack space. It offers two serial digital outputs at 1.485Gbps and YUV/RGB analog outputs. The digital and analog outputs are simultaneous on the rear panel and contain the same test pattern. It can be a free-running (standalone) unit or a genlock unit with a pair of looping BNC connectors on the rear panel. The genlock provides infinite adjustments of horizontal and vertical timing and genlock indication. You can embed internal audio tones on the digital video output if desired. There are two audio groups supported, which will allow for eight channels. The channels can be enabled on an individual basis. The internal tones generated are adjustable from 400Hz to 10KHz with amplitude adjustment from -30 to 0 dBFS and silence. The unit can also generate AES3 or AES11 (DARS) audio. Two BNC connectors for AES output allow for four channels of audio for monitoring. There are a total of thirty test signals available, including SMPTE, EIA, and Full Field Bars. There are twenty three different HD formats available plus NTSC or PAL black burst. It also has a unit identification that can be enabled to uniquely identify up to 100 different units. It also features the ability to flash the unit identification on and off or the ID. Settings can be changed to a frame or second counter making the video active so that one can see if the video has been frozen when going thru other equipment. The HD-SDI output has a resettable ANC embedded time code. The output also has ANC embedded Active Format Description (AFD) in which the AFD value and the inserted line can be changed. There is a Video Payload Identifier (VPID) embedded in the SDI output. The SDI output also has a CEA-608 and CEA-708 test message embedded on it. This allows you to test the ability of other equipment to read and pass this data. A pair of lighted push buttons and an optical rotary encoder changes and selects between various menus. The 20X2 Vacuum Fluorescent Display displays data for operational functions. The user may choose to have all of the selections saved for power up defaults. Box Dimensions (LxWxH) 21.0 x 19.6 x 6.0"